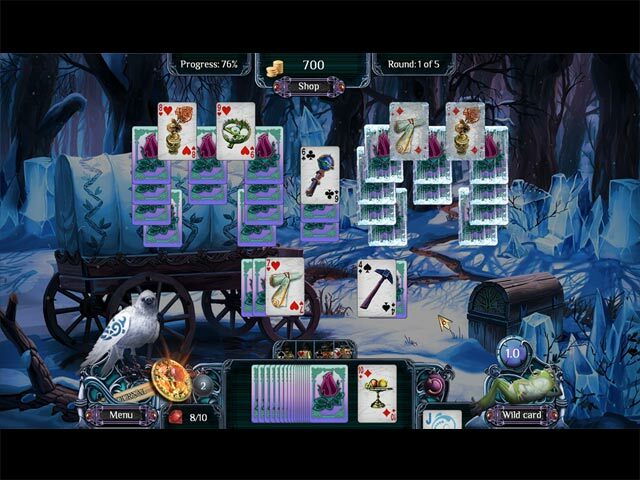 In this magical Solitaire game you must defeat the Ice Queen before the land is sealed in eternal winter! The Ice Queen, filled with anger and bent on revenge has cast a cold harsh winter upon the kingdoms! Princess Arianna is our last hope, but she needs your help in her difficult journey. Only you can control the power of the magic cards. Display your solitaire skills and aid the Princess in her mission to defeat the Ice Queen before the land is sealed in eternal winter! Keep it cool and play your cards right! 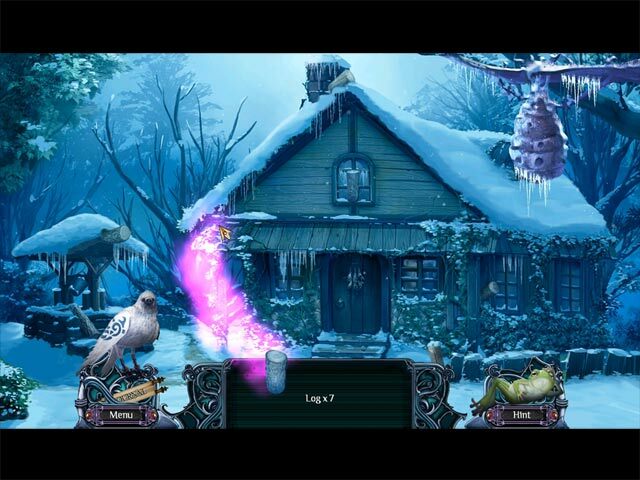 - Defeat the Ice Queen! Spider alert, for those sensitive to such things! Options include separate sliders for music and sound, full-screen, widescreen and custom cursor. When I play a solitaire game, I really like a challenge. Click-click-clicking just doesn't keep my interest as much as a game where I have to strategize, so the gameplay in this one was disappointing for me. I'll explain below. 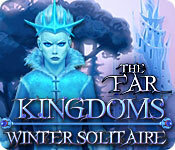 Winter Solitaire is the second game in The Far Kingdoms solitaire series. The story is very thin - just barely holding things together - so it wasn't confusing for me to have played this game first. 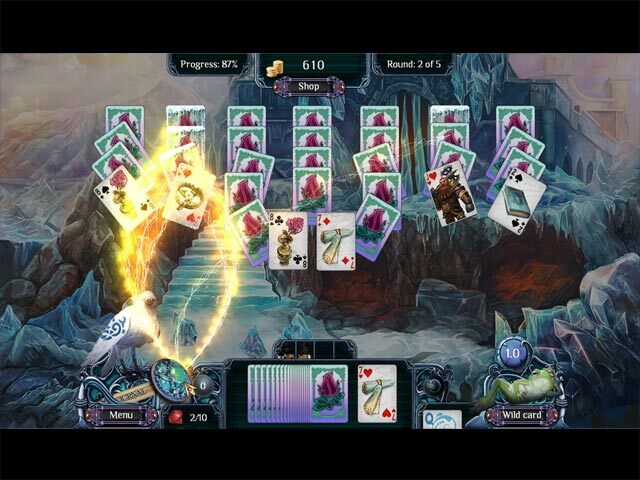 There are 20 levels to the game, each consisting of five rounds of +1/-1 solitaire. Click on cards that are one higher or one lower than the foundation card, making runs (combos) as high as possible before you have to draw another card. Occasionally you will have a "hidden object scene", which is simply finding 10 of whatever-item the story calls for at the time. There is a rechargeable HINT for these levels, and no penalty when you use them. To pass each level, you need to collect 10 rubies, which can be found beneath piles of cards in the playing field. Rounds can be re-played as many times as you like before progressing to the next round. Here's where it fell flat for me. We are given stats at the end of each level, but they're pretty much meaningless, since there is no minimum-card-left to pass the round. You can match one single card on a round, and still progress to the next round... As long as you have 10 gems before you hit the "Continue" button on round 5/5, that's all that's required to progress in the game. NOTE: You CANNOT go back and replay levels that you've already completed, and when you reach the end, that's it, game over. There's no incentive to clear all of the cards or to clear as many as possible. No achievements, no requirements. Just those 10 gems, and you can technically get all 10 of them by just replaying one hand until you have them all. If you accidentally hit "Continue" on round 5/5 without having all 10 gems, you'll have to start the level over again, but you'll ONLY lose the gems you've accumulated for the level - not any money you've earned. Speaking of money, we have a shop with a few useful items, such as an extra undo, or starting your combo meter at 1.2, but I couldn't use either the sword or the spear - I never could find a way to use them! Items that you purchase can be sold for half of what you paid for them. Another plus would be our froggy friend, who will sell us random wild cards for 100 gold each. Much more helpful than the shop items, anyway! First of all, we have three choices for card face design. The deck design is lovely already, but getting to choose what the rest of the deck looks like was a nice touch! The sound effects were nice, and the music also quite nice, but it's the graphics where the game really shines. I really appreciated that they give us plenty of time to take screenshots of their lovely background artwork. Kudos for that! I think the developers missed the opportunity to make this a truly addictive card game by leaving the structure too "loose", and with too little challenge, but all is not lost. I think that one can make it more interesting by adding their own restrictions, such as not going on to the next round unless there are less than three cards left, or by having to have perfects on every round. If however you prefer to just zone on an easy card game, this will fill that desire as well! Recommended for those who like easy card games, and for those who are willing to add their own challenges to make things more interesting. oh no, not spiders! Races to go see if this is one of the games I just got...lol I hate spiders and bugs in general can stay out of my personal area. It's one scene, Tanya (I think one of the find-10 scenes) - hopefully you can handle it!